Enriched by our vast industrial experience in this business, we are involved in offering an enormous quality range of Polyester Capacitos. - Low inductive cell of metallized polyester film coated with flame retardant epoxy resin. - Capacitance Range: 5%, 10%. 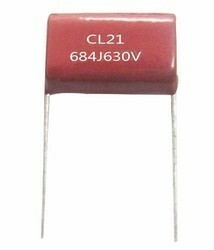 We are engaged in offering wide range of Metalized Polyester/Polypropylene Capacitors - DEKI to our clients.